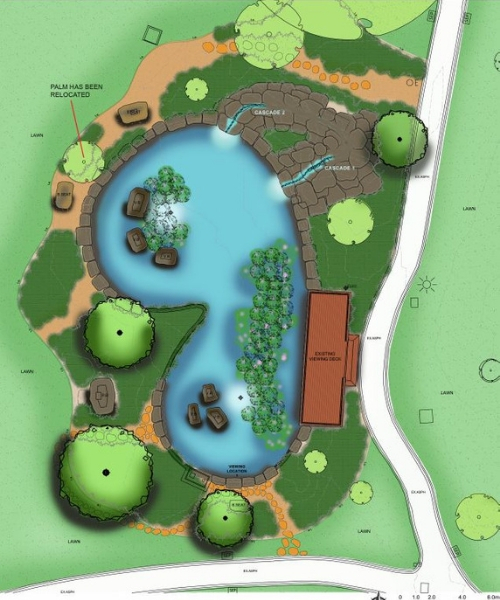 We’re redeveloping the pond located at Fordham Gardens to improve the aesthetics and amenity of the park for the community to enjoy. Artist's sketch of the Fordham Gardens Pond redevelopment. In 2010 and 2015 we sought community feedback on two concept plans for the redevelopment of the pond. 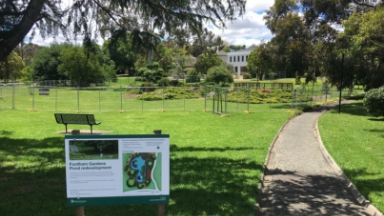 Funding has now been approved for the detailed design and redevelopment of the pond (through Council's Capital Works Renewal Program) and construction has commenced to deliver on the final design. refurbishing the newly planned cascade rock feature in place of the previous open ponds. Works commenced in early December 2018 and construction is estimated to take approximately 10 weeks. During the construction period, the pond will be fenced off to ensure residents’ safety. Construction progress January 2019 – Concrete pour for the pond base and sides completed. Ready to start work on the cascade water feature.